THE idea of the evil spirit, malicious and revengeful, is common to all primitive peoples, and Brittany has its full share of demonology. Wherever, in fact, a primitive and illiterate peasantry is found the demon is its inevitable accompaniment. But we shall not find these Breton devils so very different from the fiends of other lands. discredited, have often a connexion with the calendar, and we may have here some calendric reference, or again the chant may be merely a nonsense rhyme. Bad luck attached itself to the human who chanced to behold the midnight revels of the nains, and if he entered the charmed circle and danced along with them his death was certain to ensue before the year was out. Wednesday was the nains' high-day, or rather night, and their great nuit festale was the first Wednesday in May. That they should have possessed a fixed festival at such a period, full of religious significance for most primitive peoples, would seem to show that they must at one time have been held in considerable esteem. But although the nains while away their time in such simple fashion as dancing to the repetition of the names of the days of the week, they have a less innocent side to their characters, for they are forgers of false money, which they fabricate in the recesses of caverns. We all recall stories of fairy gold and its perishable nature. A simple youth sells something on market day to a fairy, and later on turning over in his pocket the money he has received he finds that it has been transformed into beans. The housewife receives gold from a fairy for services rendered, and carefully places it in a drawer. A day when she requires it arrives, but, alas! when she opens the cabinet to take it out she finds nothing but a small heap of withered leaves. It is such money that the nains manufacture in their subterranean mints--coin which bears the fairy impress of glamourie for a space, but on later examination proves to be merely dross. on several of the megalithic monuments of Morbihan, and especially those of Gavrinis. He who is able to decipher this magic script, says tradition, will be able to tell where hidden treasure is to be found in any part of the country. Lest any needy folk be of a mind to fare to Brittany to try their luck in this respect it is only right to warn them that in all probability they will find the treasure formula in ogham characters or serpentine markings, and that as the first has long ago been deciphered and the second is pure symbolism they will waste their time and money in any event. Sorcery hangs about the nain like a garment. Here he is a prophet and a diviner as well as an enchanter, and as much of his magic power is employed for ill, small wonder that the Breton peasant shudders and frowns when the name of the fearsome tribe is spoken and gives the dolmens they are supposed to haunt the widest of wide berths au clair de la lune. exceedingly strong, just as the Scottish peasantry speak of the Picts of folk-lore-'wee fouk but unco strang.' Every night the gorics dance in circles round the stones of Carnac, and should a mortal interrupt their frolic he is forced to join in the dance, until, breathless and exhausted, he falls prone to the earth amid peals of mocking laughter. Like the nains, the gorics are the guardians of hidden treasure, for the tale goes that beneath one of the menhirs of Carnac lies a golden hoard, and that all the other stones have been set up the better to conceal it, and so mystify those who would discover its resting-place. A calculation, the key to which is to be found in the Tower of London, will alone indicate the spot where the treasure lies. And here it may be of interest to state that the ancient national fortalice of England occurs frequently in Breton and in Celtic romance. 1 Some of the immigrant Britons into Armorica probably came from the settlement which was later to grow into London, and may have carried tales of its ancient British fortress into their new home. The courils are peculiar to the ruins of Tresmalouen. Like the gorics, they are fond of dancing, and they are quite as malignantly inclined toward the unhappy stranger who may stumble into their ring. The castle of Morlaix, too, is haunted by gorics not more than a foot high, who dwell beneath it in holes in the ground. They possess treasures as great as those of the gnomes of Norway or Germany, and these they will sometimes bestow on lucky mortals, who are permitted,, however, to take but one handful. If a person should attempt to seize more the whole of the money vanishes, and the offender's ears are soundly boxed by invisible hands. The night-washers (eur tunnerez noz) are evil spirits who appear at night on the banks of streams and call on the passers-by to assist them to wash the linen of the dead. If they are refused, they seize upon the person who denies them, drag him into the water, and break his arms. These beings are obviously the same as the Bean Nighe, 'the Washing Woman' of the Scottish Highlands, who is seen in lonely places beside a pool or stream, washing the linen of those who will shortly die. In Skye she is said to be short of stature. If any one catches her she tells all that will befall him in after life. In Perthshire she is represented as "small and round and dressed in pretty green." [paragraph continues] Saint-Malo. just as they are about to draw in their nets this mischievous spirit leaps around them, freeing the fish, or he will loosen a boat's anchor so that it will drift on to a sand-bank. He may divide the cable which holds the anchor to the vessel and cause endless trouble. This spirit received its name from an officer who commanded a battalion of fishermen conscripts, and who from his intense severity and general reputation as a martinet obtained a bad reputation among the seafaring population. The Mourioche is a malicious demon of bestial nature, able, it would seem, to transform himself into any animal shape he chooses. In general appearance he is like a year-old foal. He is especially dangerous to children, and Breton babies are often chided when noisy or mischievous with the words: "Be good, now, the Mourioche is coming!" Of one who appears to have received a shock, also, it is said: "He has seen the Mourioche." Unlucky is the person who gets in his way; but doubly so the unfortunate who attempts to mount him in the belief that he is an ordinary steed, for after a fiery gallop he will be precipitated into an abyss and break his neck. wagon of the Ankou passes on. The Ankou herself--for the dread death-spirit of Brittany is probably female--is usually represented as a skeleton. M. Anatole le Braz has elaborated a study of the whole question in his book on the legend of death in Brittany, 1 and it is probable that the Ankou is a survival of the death-goddess of the prehistoric dolmen-builders of Brittany. MacCulloch 2 considers the Ankou to be a reminiscence of the Celtic god of death, who watches over all things beyond the grave and carries off the dead to his kingdom, but greatly influenced by medieval ideas of 'Death the skeleton.' In some Breton churches a little model or statuette of the Ankou is to be seen, and this is nothing more nor less than a cleverly fashioned skeleton. The peasant origin of the belief can be found in the substitution of a cart or wagon for the more ambitious coach and four of other lands. Dark and gloomy are many of the Breton legends, of evil things, gloomy as the depths of the forests in which doubtless many of them were conceived. Most folktales are tinged with melancholy, and it is rarely in Breton story that we discover a vein of the joyous. certain point, but woe betide him who would advance farther, for, surrounded by what seems solid ground, lies a treacherous quagmire declared by the people of the neighbourhood to be unfathomable. This part of the bog, whose victims have been many, is known as the Youdic. As one leans over it its waters may sometimes be seen to simmer and boil, and the peasants of the country-side devoutly believe that when this occurs infernal forces are working beneath, madly revelling, and that it is only the near presence of St Michael, whose mount is hard by, which restrains them from doing active harm to those who may have to cross the Yeun. Countless stories are afloat concerning this weird maelstrom of mud and bubbling water. At one time it was the custom to hurl animals suspected of being evil spirits into its black depths. 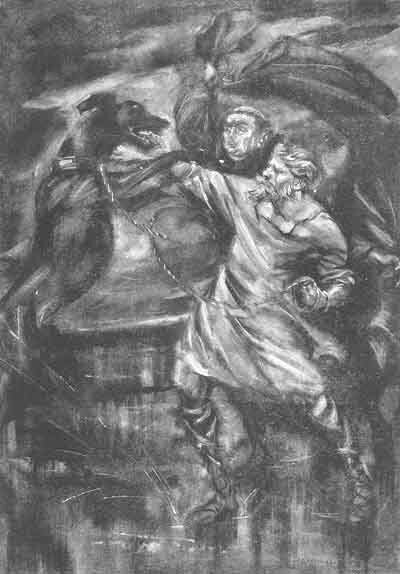 Malevolent fiends, it was thought, were wont to materialize in the form of great black dogs, and unfortunate animals of this type, if they evinced such peculiarities as were likely to place them under suspicion, were taken forthwith to the Youdic by a member of the enlightened priesthood of the district, and were cast into its seething depths with all the ceremonies suitable to such an occasion. A story typical of those told about the place is that of one Job Ann Drez, who seems to have acted as sexton and assisted the parish priest in his dealings with the supernatural. Along with the priest, job repaired one evening after sunset to the gloomy waters of the Youdic, dragging behind him a large black dog of the species most likely to excite distrust in the priestly mind. The priest showed considerable anxiety lest the animal should break loose. If he should get away," he said nervously, "both of us are lost." "I will wager he does not," replied Job, tying the cord by which the brute was led securely to his wrist. "Forward, then," said the priest, and he walked boldly in front, until they came to the foot of the mountain on the summit of which lies the Youdic. The priest turned warningly to Job. "You must be circumspect in this place," he said very gravely. "Whatever you may hear, be sure not to turn your head. 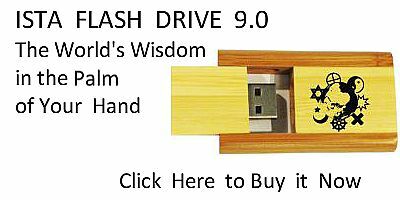 Your life in this world and your salvation in the next depend absolutely on this. You understand me?" "Yes, sir, I understand." A vast desolation surrounded them. So dark was the night that it seemed to envelop them like a velvet curtain. Beneath their feet they heard the hissing and moaning of the bog, awaiting its prey like a restless and voracious wild beast. Through the dense black ness they could see the iridescent waters writhing and gleaming below. "Surely," said Job half to himself, "this must be the gateway to hell!" At that word the dog uttered a frightful howl-such a howl as froze job's blood in his veins. It tugged and strained at the cord which held it with the strength of a demon, striving to turn on job and rend him. "Hold on!" cried the priest in mortal terror, keeping at a safe distance, however. "Hold on, I entreat you, or else we are undone!" stoutest heart. "Iou! Iou!" it yelled again and again. But Job held on desperately, although the cord cut his hands and blood ran from the scarified palms. Inch by inch he dragged the brute toward the Youdic. The creature in a last desperate effort turned and was about to spring on him open-mouthed, when all at once the priest, darting forward, threw his cloak over its head. It uttered a shriek which sounded through the night like the cry of a lost soul. "Quick!" cried the priest. "Lie flat on the earth and put your face on the ground!" Scarcely had the two men done so than a frightful tumult ensued. First there was the sound of a body leaping into the morass, then such an uproar as could only proceed from the mouth of the infernal regions. Shrieks, cries, hissings, explosions followed in quick succession for upward of half an hour; then gradually they died away and a horrible stillness took their place. The two men rose trembling and unnerved, and slowly took their way through the darkness, groping and stumbling until they had left the awful vicinity of the Yeun behind them. 99:1 See Nutt, Celtic and Mediæval Romance. 102:1 La Legende de la Mort. 102:2 Religion of the Ancient Celts, p. 345.